If you truly want to quit smoking for life, there are many stop smoking programs from which you can choose. The success rates of these programs can reach up to nearly 50% smoke free after one year, a very high rate in this field. This is because stop smoking programs are designed to give you emotional, mental, and physical support to help you quit and stay off cigarettes for the rest of your life. Studies show that quitters who have a large network of support with not only family or friends, but also health care professionals and other quitters are more likely to stay from cigarettes than those people who quit on their own. In fact, only 5% of solitary quitters are still smoking free after their first year. When you are looking for a stop smoking program, you should find one that is suited to your lifestyle. Today, you have the choice of phone support, online support, or face to face support. Some people may find a combination of any or all of the three the most effective. A phone support system is a good choice, especially for someone who is shy about asking for help. It gives you the warmth of talking to a real human being, but with the anonymity of a phone call. It can bridge the gap between face to face and online groups. There are many quitters’ hot lines; some are private groups that might be linked to a hospital, others are government funded, usually state by state. All hot lines come with a local or toll-free number for you to dial. You can receive tips, encouragement, or track your progress with counsellors. If you think that you might do better in a face to face stop smoking program, you should consider looking up your local branch of Nicotine Anonymous. This group is founded on the proven twelve step program that was pioneered by Alcoholics Anonymous. You meet once or twice a week with your support group and discuss your individual trials and triumphs as you accept you have a smoking problem and then work your way out of that problem. Many people enjoy the supportive atmosphere of these Anonymous groups so much that they keep coming for years, eventually offering inspiration and support to newer members. Busy people might say that they simply don’t have time to quit. However, online stop smoking programs eliminate that excuse. You can choice any number of chat forums to get advice and encouragement from other people who are also going through the quitting process. Sometimes these rooms are moderated by a smoking counsellor. You might be directed to web sites that offer in depth information about quitting or sell stop smoking products. If you a smoker who wants to quit, there are so many options available on the market today. However most treatments, like nicotine gum or patches actually contain nicotine or drugs. Many times people are looking for a more natural solution. The good news is there are options available. The following are the most advanced natural methods that people use to help them quit smoking. While most traditional products like nicotine gum and the patch contain small amounts of nicotine, herbal treatments are designed to lower your cravings without the use of nicotine or drugs of any kind. Not only that, but they can also help lessen the stress and irritability that usually happens to people who quit smoking. Avena Sativa: For centuries Indian healers have been using it to treat opium addiction. It also helps fight addiction to nicotine by helping people control the anxiety and depression that quitting causes. Garcinia Cambogia: This natural appetite suppressant helps fight the urge people have to eat more while they are trying to quit smoking. Gotu Cola: By naturally stimulating the brain and nervous system, it helps relieve the anxiety that caused by quitting. There are several different ways these herbs can be applied. They either come in packages that are applied like a band aid. A concentrate that’s mixed with water is also another popular method of consumption. For years hypnosis has been effective ways of helping people eliminate all kinds of bad habits, including smoking. Studies have showed that hypnosis can be up to 40% more effective as a way to help people quit smoking, as long as it’s used with other methods. These techniques will relax your mind and body, keeping your subconscious mind open to suggestions that will help you quit smoking. By reorienting your way of thinking on a subconscious level you’ll be better able to handle both your psychological and physical addiction to nicotine. It’s important to research any hypnotherapist before going to one. While most are licensed professionals, you want to make sure before trusting your health to one. This involves placing needles into various points of your body. While it may sound scary, it is an ancient Chinese art that has been around for thousands of years. Most experts are unsure exactly how it works, but the important thing is that it does. It’s also a good idea to use acupuncture along with other natural stop smoking methods. Like with Hypnosis, it’s important you go to a trained professional. It could be dangerous if done incorrectly. Make sure you find out if your state requires a license. It’s also important to check all references before you allow anyone to stick a needle in you. If you’re serious about quieting, please visit our home page: Stop Smoking Today. We are a web site that’s dedicated to helping people quit. The sooner you make the decision to go for it, the sooner you can start leading a happier, healthier life. The Free and Clear Quit for Life program is one of the most effective stop smoking programs on the market today. It can be done individually, but is also tailored to a corporate environment to lead an office-wide smoking cessation movement. There are three areas that the Quit for Life program targets: physical, psychological, and behavioural. Each one of these areas is a different facet of a smoking addiction and each need to be targeted separately in order for quitting being really successful. The first step of the program involves making contact with a Quit Coach, either over the phone or in your office. The coach and the smoker come up with a personalized plan to help the smoker quit that are based on his tobacco use history and current smoking behaviours. Further meetings are scheduled with the Quit Coach to follow up on the progress of the program. They are then given access to Web Coach, an online quitting tool and support community. Through the Web Coach site you can chat with other people who are also quitting and going through the same troubles that you are. You can also read motivational material to inspire you to stay away from tobacco as well as medical facts about the ways that smoking will hurt you and your loved ones. If your Quit Coach feels that your addiction is physical, they can recommend various over the counter and prescription quit smoking aids and medication that can help you to tame your cravings and get you through your quitting process as painlessly as possible. You will be given guidance on the proper dosage and the pros and cons of each type of quitting aid. You can also arrange to have these products mailed to your door so you don’t have to go out and hunt for them at the store. The Quit for Life program has nearly a 50% success rate, nearly the highest for any product or program. If you are seriously about quitting smoking and embarking on a cleaner and healthier lifestyle, you should look into this or one of the many stop smoking programs that are available through your employer, health insurance company, or online. First you have to decide whether you want your hypnosis program to be live-in-person, or if a print or audio version will suit your needs. Here are three things to consider: The personal learning style, your available time, and finally…how much will it cost? First, what is your personal learning style? Some people learn better when they can talk to another person. They like to ask a lot of questions, they like to get feedback or they simply want reassurance. If that sounds like you, you might want to consider a one-on-one and hypnosis counselling program to help you quit smoking. Or you might want to consider a group counselling, setting. Many people benefit from interacting with other people who are going through the same experiences. Peer support can be useful if you like using the “buddy system”, or if you like doing things in a team environment. Next, you have to consider how much time you have available, and how flexible you can be with that time. Individual and group hypnotherapy sessions require scheduling. You have to make a commitment to show up in person at a given time, on a regular basis. For people who have routine schedule already, it may be just a matter of putting another date on the calendar. But if you’re one of those people who already have so many things on your calendar that it’s overflowing, it might be difficult for you to squeeze another commitment in. Or what if your schedule is unpredictable, or changes every week? Even if you really have your heart set on joining a quit smoking group, or having a weekly face-to-face meeting with your smoking cessation counsellor, it just might not be practical for your lifestyle. Last, there’s the matter of cost. Of course, if money is no object for you, you can just skip reading this paragraph! But for most people, money is a consideration. And even though your cash flow will improve when you stop buying cigarettes or cigars, you might still have to think about your budget. In-person hypnotherapy programs for smoking cessation are not cheap. They can cost $100 per session or more. Now multiply that by the number of sessions that you’ll need to quit smoking. Now you have a good estimate of how much smoking counselling might cost you. If that’s more than you want to or can afford to spend, there are still really good options available. You can purchase a quit smoking hypnosis program in print or in audio for a one-time cost of less than $100. You can buy stop smoking books or CDs, or downloadable e-books or MP3 files that you can play on your iPod. These quit smoking hypnosis programs are just as effective as the in-person approach for many people. And they’re especially good for people who like to be able to review their lessons. If that sounds like you, then you’re in luck. There are a lot of great products to choose from. You’ll have to decide whether you want a product that you can read, or if you would prefer a product that you can listen to. Sometimes you can even find both options in one product. But even if you have to be concerned about your budget when you buy a program to help you quit smoking, make sure that you don’t make your purchase based on price alone. Sometimes the cheapest really is the best. But if it’s not, you deserve the best that you can afford. After all, it’s your life. 1. Set Your Mind is an essential component and one of the most important to stop smoking program. So many people try to quit, but do not start with the right mindset. They have good intentions, but the guard in the back of the head, again, the idea that it does not really want to do without, and sooner or later you start to smoke. This in mind will soon flow into the centre of your thinking, if you give first, that your life without cigarettes a brief experiment in the long term. 2. Set a date, you can stop smoking program (not too far or it will never happen!). Before closing the day, change some of your smoking habit: Switch to a brand of cigarettes you do not like to identify a time that you try the regular cigarette (with a cup of coffee after dinner, etc.) and try other things too slowly, rather than a cigarette habit (eating fruit or drinking a glass of water that was happening). 3. If you left when you get rid of smoking accessories for the home and workplace and wherever you smoke anywhere in the rule. And throw the rest away to get rid of cigarettes, lighters and ashtrays not remember every effort to ensure that you are either smoke or you will be coaxial with a shot malicious. 4. Change your normal routine, like when you’re sitting, breakfast. Many of cigarettes smoked during the day regularly made, so if you are a new routine without even having a cigarette, it is much easier to develop for you. 5. Always have something that you put in your mouth if you feel like smoking, something like candy or chewing gum. 6. Write down all the advantages that you can stop smoking program, such as the possibility of heart attacks, cancer and stroke, to feel more in control of your life, the better the odour of hair, breath, clothes, home and car, on foot more resistance or perception, less coughing, colds and flu and more money from the sale of cigarettes is not registered. Keep this list with you at all times and read every day. 7. Reward yourself for not smoking too much. Put aside the money they would normally spend on cigarettes and treat you to a new dress or go out to dinner. Look at the benefits with the more money you save. Follow these important tips on how to stop smoking program, and some, if not all remember the dependence of combat. But these are some of the best practices, and monitor for further support and advice, you should always sort of program that will help, but the whole process. Stop Smoking Program Today is a proven method that works exactly as she says, helps you kick the habit today! Successfully combating an addiction to smoking, you need the right attitude and the ability to reduce nicotine addiction, and not just for a while, but in the long term. This is what the program to quit smoking can do for you; this is not only fast, but makes one stands firm. What Is the Best Stop Smoking Program? Are you ready to quit smoking? If yes, then it’s the best decision. Smoking is the important cause of preventable death. In fact, there is nothing worse you can do to adversely influence your health. Smoking is an important risk factor for respiratory illnesses, causing 85,000 deaths per year from pulmonary diseases such as lasting obstructive pulmonary disease (C.O.P.D.) and pneumonia. Additionally, one third of all cancer deaths are caused by smoking. Now that you’ve decided to quit your nicotine addiction, do you have a plan? Are you going to quit cold turkey? Have you picked a date yet? Do you have ideas in place to help preclude a relapse? These are all important questions to consider. Not enough will-power! When you think about it, anything can quit smoking for a few hours or a day. After that, quitting is plainly a matter of relapse control. Even if it is for a day, you’ve come to be a non-smoker – now you just have to preclude a relapse. Easier said than done but not impossible. 1) This may seem definite but get rid of any cigarettes, empty packages, ashtrays, lighters or anything you join together with smoking. Do this before your quitting day. 2) Do not depend on patches to ease the seclusion symptoms. They are expensive and can be condition damaging if you relapse while using them. 3) This is a big one: Get maintain and encouragement. Studies have shown that you’ll have a good occasion of kicking the habit if you can get maintain from families, friends, and co-workers. Don’t go it alone. 4) Smokers who drink alcohol have a higher rate of relapse than non-drinkers. With this in mind, it is a good idea to abstain from alcohol. How long should you abstain? This depends on the individual. It is going to take an immense number of will-power to refrain from smoking while drinking if this is something you have all the time done. Cigarettes and alcohol are both addictive to begin with and seem to go hand-in-hand. If you can’t cut out alcohol, at least cut it down. So the best stop smoking plan is plainly something that works for you. Like the man in the bar, you may find your own recipe of coping with your quit smoking challenge! Smokers know that smoking is bad for them. Smoking feels good, and is relaxing for most people, so it makes it hard to quit, even when knowing that this is bad for us and is going to take years off of our lives. That being said, when quitting, it is important to choose the best of the quit smoking programs out there. Some work better for some people than others. You have to think about your own life and your lifestyle when you choose the program that you want to use to quit smoking method that is going to work the best in your life. There are some great quit smoking programs out there. One of the newest is the pill that you take for a while. You take it for so many days or weeks after you have chosen a date to quit. With the pill in your system, it makes quitting on that day much easier than otherwise just stopping and hoping for the best. I know quite a few people who have chosen this as their method among the many quit smoking programs out there. It has worked well for them and they recommend it highly to anyone who wants to stop smoking. You can also get patches or gum as a part of your quit smoking programs. These replace the nicotine that you are going to lose when you quit smoking. Through the act of smoking is a part of the addiction, the nicotine is what you have a problem giving up the most. The body wants it, and that leads it to urge you to smoke. If you slowly wean from the nicotine through quit smoking programs, you are going to have better luck. Cold turkey is not always the way to go, though it does seem as if it is the easiest and cheapest. Without replacement nicotine, stopping is very hard indeed. You can also use hypnosis as one of the more powerful quit smoking programs out there. Though it might sound a little off the wall, it does work for some people. I have a friend who went through this, and it worked for her for quite a while. She did end up smoking again, but only has a few now and again. The quit smoking programs that include hypnosis work on a subconscious level. When you do this, you come out of it feeling disgusted when you see or smell a cigarette (by suggestion through hypnosis). It can be very powerful for the right person. Quitting smoking is decision that a smoker should undertake. Smoking has various bad effects on the smoker as well as people around him. Women for example, can pass several problems onto their unborn children. The smoker should begin trials to quit smoking as soon as possible. There are several smoking cessation programs for smokers: Quitting smoking is a complicated and long drawn out process, and the success rates of quitting smoking are quite slim. Veteran smokers may find it difficult to quit smoking and they may or may not be able to handle the various withdrawal symptoms that come out during the process. Nicotine patches are by far the oldest types of smoking cessation aids and are also the most popular types of smoking cessation aids. These patches provide a steady and controlled dosage of nicotine into the body. The nicotine patch helps the smoker to decrease their nicotine intake over time. These patches are available in different strengths. Over time, the smoker has to use the nicotine patches which have lower strengths, so that their nicotine intake decreases over time. Another type of nicotine cessation product is the nicotine gum. Nicotine gum is aimed at giving the smoker their daily nicotine quota in a controlled manner. Whenever the smoker gets an urge to smoke, he or she will have to use the nicotine gum. In nicotine gum, there is a certain medicine that replaces nicotine. This medicine is also instrumental in helping the smoker get over their addiction to nicotine. This gum is quite easily available and is known to be quite beneficial to smokers who wish to quit smoking. Another type of nicotine cessation product is the nicotine inhaler. With the help of this inhaler, the smoker can directly inhale the nicotine through the nasal passage. Nicotine inhaler is one of the most used and freely available products. These are the products that are nicotine based. There are also some medical related products. One can use medicines that are non nicotine based – Zyban and Chantix are the famous products in the market today. Some also use medical instances to try to quit smoking. Some try to use hypnosis as a way to quit smoking. However, there is little proof that this type of hypnosis works for the person who is trying to quit smoking. Other studies hint that acupuncture and acupressure can also help a smoker to stop smoking. 1. 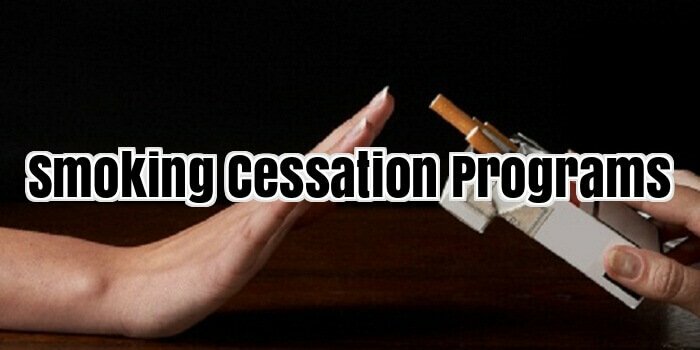 Online cessation programs: The internet is full with online programs, websites and forum to support quitters. 2. Cessation Support groups: Many governments and private or public institutions around the globe established smoking succession supporting groups. Thus, in order to decrease the number of smokers and to control the smoking health dangers. These are just some of the aids and smoking cessation items/objects that are used by smokers all over the world. Frankly, over and above to the smoking cessation means listed, the biggest cessation aid for smokers is the MIND: The mind and the mental readiness. Once the smoker has decided to quit smoking, only then can s/he be able to actually quit smoking. Of course, the smoking cessations products may help a lot, but unless and until a person is not mentally ready to quit smoking, none of the smoking cessation products make any sense of usage. It takes a long time for the smoker to achieve what is known as ‘cold turkey’. When the person becomes a cold turkey, they would not feel like having a cigarette even if everyone around them is smoking. Being a cold turkey requires a lot of patience, tolerance and of course, the stiff decision and willing to quit smoking. In essence, there is nothing spooky about hypnosis, for smoking cessation or for anything else. It simply places a person in a semi-aware, semi-trance like state. Some people are more affected or ‘susceptible’ than others, but most people are able to be hypnotised to a certain extent. A hypnotic state is similar to when one has awoken from a dream, although reality can sometimes be slightly confused with the fading dream. You are put into this state by the hypnotherapist using simple forms of persuasion, relaxation and focusing techniques. The hypnotherapist is then able to have your full focus, nearly 100%, which is never the case in a fully awakened state, so they can talk to your subconscious where most issues tend to reside. Furthermore, the greater a person wants the outcome of the hypnosis, then the more effective it is likely to be. Will I be ‘out for the count’ during a hypnotherapy session? Make no mistake, the subject of hypnosis may be in a fully relaxed and in a semi-trance, but is still generally aware of what is happening. No person can be hypnotised into doing something that they definitely do NOT want to do. Sadly, some foolish people want to learn hypnosis as a means of hypnotising others so they can make them do things they wouldn’t otherwise want to do. This is does not work, and will usually have the opposite effect since the subject knows exactly what is happening. This syndrome and fantasies around professional ‘stage’ hypnotism has given rise to the idea that a hypnotist has all sorts of fantastic dark abilities. Generally, it is a gentle art, and can be very effective in certain situations where therapy is required. Why Hypnosis Only Works Very Occasionally To Quit Smoking? The truth is most people do not realise that smokers suffer from both a physical nicotine addiction, AND a mental addiction. Furthermore, these must be conquered in parallel. If hypnosis is used alone, or by a hypnotherapist who does not understand the double-sided nature of the addiction, then the hypnotherapy will fail. Here is why: If a hypnotherapist, for example, decides to give you a nicotine replacement (such as nicotine patches) to help deal with the physical addiction while they attempt to use hypnosis to fix the mental addiction, it may confuse and upset the subject being treated. This is because your subconscious is told on one hand that nicotine is not needed, and that it could kill you etc, but also is told on the other that nicotine is so valuable and prized that it cannot be taken away, but instead only replaced with something equal. What is the subconscious to believe? The subconscious mind may then fight attempts make to stop, with extreme withdrawal symptoms accompanied by upset and confusion. Hypnotherapy can be expensive and may still be ineffective. Even if you did strike the right hypnotherapist, who knows the entire approach, who understands the double-sided nature of a smoker’s addiction, you would still have to attend many sessions to see if it works – if it in fact it did at all. Plus you can easily pay an exorbitant amount for these sessions – the cost to see a real person in there clinic or offices. Why CDs And Tapes Are Not Effective? In essence the key to successful hypnotherapy is whether the person really wants to quit and whether the hypnotherapist can successfully customise the course to the individual. Smoking addiction is never a simple situation to deal with, and may be made more difficult by the subject having to deal with other issues at the same time such as family or money problems. This can affect the outcome, and the hypnotherapist may need to take all this into account. CDs / DVDs, tapes and podcasts offering quit-smoking self-hypnotherapy have no capacity for customising a quit smoking program to the individual. They also do not deal with the nicotine addiction side of quitting smoking. If you are a smoker, you will probably know how difficult it can be to quit once and for all. The thought that there might be a solution for us [smokers] captures every smoker’s imagination. Unfortunately, the laser smoking cessation process you may have heard about is not the salvation that you hope it might be. This is because it is founded on the ancient art of acupuncture, a system derived without scientific process or rigour and one that is found to be wanting. Before even bothering to wonder why laser light instead of metal needles or normal light would be a more effective variation of acupuncture, we should also ask whether or not acupuncture itself is a well-founded process for treating smoking (or anything else for that matter). The answer is a conclusive ‘no’! Research from the Cochrane Collaboration shows that acupuncture has no better success at helping people quit smoking than quitting cold turkey. Acupuncture has been found useful only in relieving pain but not in any other field of medicine, addiction treatment or therapy. The bad news is that this sort of treatment [laser smoking cessation] falls into the sphere of what I call ‘meta-medicine’. It is a parallel of metaphysics. It isn’t really medicine at all, it is just a ‘procedure’ based on absolutely no evidence whatsoever! Whilst there are practitioners out there who will try to sell you laser smoking cessation therapy or so-called bio resonance treatments, their methods are no more proven than standing in a bucket of frogs is for helping you stop smoking. My advice to you is to stay well clear of unscientific processes to deal with nicotine addiction and tobacco dependence. You are much better off avoiding unspecified herbal concoctions and faith healing methods and sticking closer to the mainstream and always demanding a 100% money back guarantee. There are people who actually are able to quit smoking on their own, but admittedly, there are only a few of them. Most other nicotine addicts find themselves always having to seek help from various quarters to break the habit. And that is not so strange either. With the level of addictiveness of the substance, a single exposure could hook you for life, and the craving for cigarette or cigar smoke can cause you to go back to the substance time and time again even as you try to abstain from it. If you need assistance with breaking the habit – and you know you do too – you should try to get in touch with any one of these stop smoking organizations and let them lend a helping hand to you, they are easy enough to find on the Internet. The American Cancer Society, for instance, offers extensive information on the health issues that are related to tobacco use, on government regulations and the tobacco industry, tips on quitting smoking and tobacco use, and other such resources that are a great help. You can get similar information and tips from the CDC’s – Centre for Disease Control’s – home page on the Internet. And there are countless e-books online that do precisely that. Getting help for smoking cessation however should not be limited to reading of various materials on the subject. You should take decisive steps too that could save your life. See a doctor, sing up with a psychotherapist, join a support group in person and on the Internet, and buy you any number of quit smoking aids that you can lay your hands on. There are physical and psychological aspects to nicotine addiction, and they all need to be addressed. If you have been trying to break the habit for very long, you may even have to sign yourself into a rehabilitation centre or something. At least in there you can get all the attention you can get medically and therapeutically for your quit smoking effort. Finally, to manage the danger of relapse after you have succeeded in staying off of the habit for a while, you should keep in touch with your smoking cessation support group. Hearing from those who have tried and failed, and tried and succeeded before helps you stay focused in its own way. However, being there to help other people who are trying to break the habit, to share your own stories with them and to help them with their own struggle is also very rewarding. You are not complete until you have both. I will be the first to tell you that the craving for nicotine or tobacco never really does go away. Over time it lessens, but at any time that you let your guard down you could suddenly find yourself puffing away at another stick of cigarette again. For that reason, you really cannot be too carefree about the kind of help you get to break the habit because you may need it for as long as you live. You must first and foremost know that you want to quit, and you need to know why. It may be helpful to make a list of what you will gain or how you expect you will feel after quitting. Keep this list handy and look at it whenever you feel challenged to smoke. In other words you need to want to quit. ACCEPTANCE OF PERSONAL RESPONSIBILITY: The state of being held as the cause of something that needs to be set right (responsibility for smoking lies with the smoker); accepts blame, fault, liability, accountability. You have to accept that you are responsible for your habit. Yes the cigarette manufacturers made it easy for you to get cigarettes, they made it look cool to smoke, and they put advertisements in your face, everywhere they could, however you lit the flame, you could have said no. Smoking is a choice, you could choose not to. PERSONAL DISCPLINE: training that corrects moulds, or perfects the mental faculties or moral character; control gained by enforcing obedience or order, orderly or prescribed conduct or pattern of behaviour. You will have to have personal discipline to force yourself to not light up. Contrary to popular opinion you will not have physical discomfort from quitting, no physical withdrawal symptoms if you will. However, you will have strong habitual mechanical reflexes to overcome, reaching for a pack or lighter, you will have strong mental urges to overcome. Some of these reflexes and urges will go on for many years; they will surprise you when they happen. It takes personal discipline to overcome these reflexes and urges. COMMITMENT: an agreement or pledge to do something in the future; something pledged; the state or an instance of being obligated or emotionally impelled (a commitment to quit smoking). Commitment is the cement that will hold this all together, if you will promise yourself that you can succeed, you will. Tell other people that you have quit smoking. Some will try to derail you; they are the ones who do not have the will to try to quit them. Challenge yourself to show them that you really do have the commitment and will power to quit. Try to find some ex-smokers to hang out with, they have fought the battle you are fighting, they know this is hard work, they will support you. PASSION: This is the real secret. Transfer the passion that you have for smoking, to not smoking. Do you think smokers are not passionate about their habit, check when they only have 1 cigarette left? Passion can be defined as an intense, driving, or overmastering feeling or a strong liking or desire for or devotion to some activity, object, or concept. Become passionate about not smoking, about improving your health and the health of those around you. Maybe you can even save your own life. It really is that important. Some consider electronic cigarette a wonderful invention; others look on them with concern. At first, they were seen as a tool for the cessation of smoking, but over the years have become increasingly considered as a substitute to actually quitting. When they first arrived on the market it was believed by most people that it was a sure fire way of stopping smoking and most health organizations welcomed them as an easy way for people to break the habit. Unfortunately, that didn’t prove to be the case. An artificial substitute for inhaling nicotine is just that, a replacement or displacement of the craving, but doesn’t actually stop the addiction. That isn’t to say that some people did have success breaking their habits by using electronic cigarettes, but it is more due to will power than any make-believe cigarettes. The World Health Organization has claimed that there are no effective studies that prove that they are safe and effective in reducing smoking. Other studies differ. The American F.D.A., although it doesn’t condemn them outright, it does discourage their use, claiming that there isn’t enough evidence in their favour. As you would expect, the Electronic Cigarette Association doesn’t agree. They point to a study carried out by the Boston University Public Health Unit which claims they found traces of harmful carcinogens lower than a thousand times the level of ordinary cigarettes and that there is little to be concerned about. The Canadian authorities have banned them, believing their harmlessness hasn’t been proved. The United Kingdom prefers the use of the e-cigarette to trying to quit alone. They believe that nicotine patches and e-cigarettes all help smokers stop. While the debate rages, more and more people are turning to e-cigarettes as a healthier alternative to smoking. As you try to kick your smoking addiction, you certainly can you use the help you can get. Physicians and psychotherapists are not unaware of the stress you have to go through while you are trying to stop smoking. Nicotine withdrawal symptoms like headaches, irritation, and anxiety can be rather severe even if you are prepared for it. At such times, even group therapy many not be enough to keep you calm. As such, your best bet may be tried on some antismoking drugs as prescribed by your physician. Antismoking drugs have their various characteristics and can be rather thorough in their function. A few of them simulate the effect of nicotine in your body the way nicotine replacement products do, while others actually inhibit the chemical processes that set about your craving for the substance. There are over four thousand chemicals in tobacco, and about forty-three of them are carcinogenic. Nicotine is chiefly responsible for addiction, so that if you can stop or hamper it action in your body, you can actually break the habit with that much more ease. The first stop smoking drug you should know of is Chantix. Chantix is a great for adults who are trying to stop smoking, as opposed to kids in the same category, especially because of its rather severe side effects. It is one of such substances that keep you from feeling the craving for nicotine so that you can go through your day without even thinking of smoking. The side effects may be severe however, including consequences like nausea, sleep disorder, constipation, headaches, and loss of appetite, mood alterations, and sometimes rashes. In the face of the adverse effects of Chantix, you may want to consider the milder Zyban. Zyban is one of a group of antidepressant drugs that inhibit the reuptake of the serotonin neurotransmitter. When secreted, these chemicals in your body cause a spike in your pleasure-seeking behavior, which makes you ‘crave’ nicotine. Zyban is the brand name for the substance bupropoin, which is not without it’s own side effects. Offshoot symptoms of bupropion include dizziness and fainting, dehydration, mouth dryness, difficulty urinating, and drowsiness. While on bupropion, you may want to abstain from milks and cheese because they set off a whole new range of side effects. Scopolamine and Atarax are two drugs that can help you stop smoking too, except that they are not orally administered drugs like the previously mentioned ones. These two, blended together into a single SMART injection are given to you intravenously. Although they are individually FDA-approved, the cocktail is still in the review process. They work well to help your smoking cessation efforts, but they also have side effects similar to those mentioned above. The fact that a drug works and saves you from the worse potential effects of nicotine is often reason enough to keep you in the program. Nicotine causes irregular heartbeats, high blood pressure, nausea and vomiting, and is a poison used in most insecticides. The other chemicals in tobacco proffer little more than increased risks of cancer and heart disease, which should convince you to stay with the program until you don’t need the drug anymore. Smoking cessation is not an easy thing to achieve, but there are people doing it all around you. Perhaps it is time for you also to give it what it takes and never smoke another cigarette again. Many smokers who finally manage to end their smoking addiction swiftly come to be disillusioned because they feel their lungs after smoking cessation still feel awful and their breathing and full, health have not greatly improved. Many then fall back into the smoking habit, using the poor excuse that they have already done so much harm to their bodies already, why stop now? This is of procedure ridiculous as it will only make things worse that they currently are. To give you an idea of what your lungs do face due to smoking, here is a sobering list. Tar – This sticky aggregate that comes from cigarettes is a major question for your lungs. It coats the inside of your airways and also seeps into the lung tissue itself. It irritates the lungs, traps in poisons form cigarettes and can cause scarring as well. It is very hard to remove. Toxins – Cigarettes comprise over 6000 chemicals that are risky to the human body. Among them are poisons used to kill rats for one, and many that are known carcinogens (they cause cancer). These toxins stay in your lungs and get into your bloodstream, going all over the body. They are sheltered from your natural detox systems by the tar present in your lungs as well. Emphysema – This health is caused by an aggregate of heat and chemicals when you inhale cigarette smoke. The alveoli – which are tiny air sacs right at the end of the lung ‘tree’ – are destroyed by this combination, never to be repaired. This inhibits the vital function of putting oxygen into the bloodstream and taking our carbon dioxide. If you lose too many of these air sacs you will find it very difficult to breath and nothing can heal this! Bronchitis – This is a health caused by irritation of the bronchial tubes in the lungs. Tar and toxins have vexed the tubes, this causes inflammation and sometimes irreversible scarring. Then succeed is an uncontrollable cough and often a coughing up of fluids. Lasting bronchitis is where this happens all the time thanks to your smoking habit. Infections – The chemicals in cigarettes can linger in your throat and lungs for a long, long time. Trapped by the tar and mucus they can often cause infections which can be irritating, painful and sometimes even incapacitating! Your lungs, throat and all parts of the pulmonary theory can be affected by this.